The grand fir is one of the tallest firs, reaching heights of 300 feet. 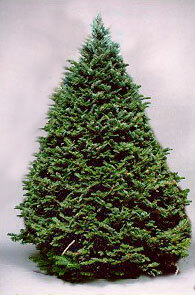 Grand Fir: It produces a beautiful, thick foliaged tree when sheared and is known for its strong fragrance. It is easily distinguished from other Pacific Northwest firs by its sprays of lustrous needles in two distinct rows. They are usually horizontally spread so that both the upper and lower sides of the branches are clearly visible. The needles are 1 to 1 1/2 inches long with glossy dark green tops and two highly visible white lines of stomata on the undersides. Trivia: Northwest native Americans have a history of making uses of grand fir foliage and branches. Kwakwaka'wakw shamans wove its branches into headdresses and costumes and used the branches for scrubbing individuals in purification rites. The Hesquiat tribes used its branches as incense and decorative clothing for wolf dancers. It was occasionally used as a fuel. Some interior tribes such as the Okanogan, also made canoes from its bark. Pitch was applied to bows for a secure grip and rubbed on paddles and scorched for a good finish. A brown dye from its bark was used in making baskets by the Straits Salish tribe, along with a pink dye made by mixing the brown dye with red ochre. Knots were shaped, steamed and carved into halibut hooks by several coastal tribes. Grand fir bark, sometimes mixed with stinging nettles, was boiled and the concoction used for bathing and as a general tonic. The Lushoot tribe boiled needles to make a medicinal tea for colds. The Ditidaht sometimes brought boughs inside as a air freshener and burned them as an incense and to make a purifying smoke to ward off illnesses. These people also crushed and mixed the bark of grand fir, red alder and western hemlock and made an infusion that was rank for internal injuries. The Hesquiat mixed the pitch of young trees with oil and rubbed it on the scalp as a deodorant and to prevent balding.